I understood it tonight -- not the papal encyclical (I'll come to that) but the business of putting people on the fourth plinth in London's Trafalgar Square: real people, standing (or sitting, or knitting, or whatever) for an hour at a time, 24 hours a day, over the next couple of months. It's called One and Other, and it's the idea of one of Britain's best-known artists, the sculptor Antony Gormley, who is Catholic-educated, if it matters. And I think it may do. I was standing under it tonight, waiting for a friend, watching above me a very ordinary-looking, slightly dumpy woman doing tai-chi, not very impressively, looking small and vulnerable on the massive stone plinth. Yet there was a small crowd of us watching her, and that, I suddenly realised, was the point: that a very ordinary human being was being perfectly ordinary on a mighty plinth in one of the world's great public squares. And she was attracting a crowd, in the way that the horse-bound kings and generals frozen on the other plinths have long since ceased to. 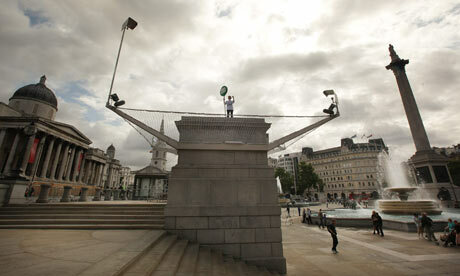 In a global city transformed by rivers of capital and immigration, where almost everything - including, and especially, human beings -- is commodified, it hit me that that through that plinth Gormley is radically asserting man as "the source, the focus and the aim of all economic social life". Those are the words of Pope Paul VI, quoted by Pope Benedict XVI at the end of paragraph 25 of Caritas in veritate: “I would like to remind governments that the primary capital to be safeguarded and valued is man, the human person in his or her integrity", he says before the quote. Providential, isn't it? In the heart of London an artist puts ordinary people on a plinth in the week that Caritas in veritate roars out the primacy of being human. As it happens, paragraph 25 concerns the scourge of long-term unemployment, the "great psychological and spiritual suffering" which results. And as it happens, that's what was on my friend's mind. Over crab dumplings in Chinatown she told me she had to shut down some of the UK offices of her New York-based multinational company. The recession is biting, and savings have to be made. She doesn't mind closing down offices. But she objects to the orders from America to fire people. "It makes no sense," she says. "People and their skills are the company's greatest asset. You can't get back that sort of investment. When the economy picks up we'll have a much higher cost in recruiting and retraining. People don't go back to work for a company which has fired them." She admired British companies which are offering their employees unpaid sabbaticals or shorter working weeks. People kept their links with the company, their dignity, their hope. And the company kept their loyalty, ready for the upturn. "They're idiots," she said of her bosses. "They don't know what's really valuable." "Yes that's what the Pope's saying," I ventured. It was dark outside. But back in the square the once-neglected fourth plinth, with its hesitant new occupant, was all lit up. I was that 'very ordinary looking, rather dumpy woman doing tai chi, not very impressively...' I wonder what a woman would look like that wasn't 'very ordinary looking'? And isn't it rather presumptious of you to assume to decide that someone is a 'very ordinary human being' when you know nothing about them? Human beings are, as individuals, all totally extraordinary, but you cannot see that by looking at them from the outside, because they are 'other' – and this, I believe, is the point of the project, which you have apparently missed.